We conducted this Auction on behalf of the Red Carnation Group who now own Ashford Castle. It was conducted over 2 days and was similar to the previous sales held at the Warehouses in Cong. This was a very interesting auction with Lots shipped in from London, Switzerland and Africa. This made for lots of interesting lots from Furniture to Lighting to Interior Finishes. Busy few days and lots of happy Customers. We conducted this Auction on behalf of the Red Carnation Group who now own Ashford Castle. It was conducted over 2 days and was similar to the previous sales held at the Warehouses. Phone Bidding was fast and furious with some of the interesting lots hitting the headlines. A Yamaha Baby Grand Piano played by Stevie Wonder at a prominent Wedding held at the hotel made a hammer price of €7,800. While a Rare 18th Century Irish Mahogany Architects Writing Table with a fitted Bookcase sold for €2,100. An Impressive 19th Century Walnut Pier Cabinet made €7,100 and sold overseas. This was a very interesting auction. This was a very interesting sale for the Interior and Exterior of any property from Yard Paving, Garden Furniture, Period Gates, Pillars to Showers, Doors, Stoves, furniture for every room in the house together with lots of Pub Memorabilia and fittings. Customers travelled from all over the country to view this sale. Online bidding was very active and the was lots of interest in the room. Following an extensive refurbishment of the Hotel, we will sell a large collection of Pictures, Prints, Wingback Armchairs, Leather Club Chairs, Longcase Clock, Antique Sideboards, Bureau Bookcases, Banqueting Chairs, Restaurant Furniture, Light Fittings and Oak Settles. We completed the two day Interiors Sale at the Cashel Palace Hotel in Tipperary. Built in 1730 by Archbishop Theophilis Bolton for the Bishop of Cashel. The Palace deisgned by Sir Edward Lovett Pearce who was also the Architect of the Pld Parliament House in Dublin, now the Bank of Ireland, Stephens Green, Having traded as a luury hotel for yeas the hotel is now entering a new chapter. To facilitate an extensive refurbishment, many of the interior furnishing were sold by auction; the Managers house, the Main Residence, The Buttery and two kitchens were included in the sale. Viewing was steady and the weather was in everyones favour. It was easy to stroll through the lovely bedrooms and admire the famous gardens from the rearview windows. Some of the items sold : A late Victorian Carved Oak Settle which sold for €2,550, a Georgian Mahogany Brass Dial 8 Day Longcase Clock sold for €2500, Mahogany cased Baby Grand by Hopkinson sold for €1850, Prints and Pictures sold from €80+, Curtains sold from €250+, Pub Memorabilia selling for €50+ and Kitchen items selling from €200+. Many people have passed through the doors over the years and many revisited over the viewing days. It was a very busy sale with both floor and internet bidders fighing to win their lots. 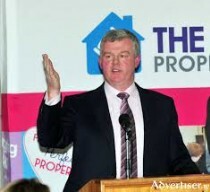 Aidan Foley conducted this sale at 10am each morning and concluded around the 6pm mark selling approx 600 lots per day. This was a huge sale and people came from all over the country to get a last look at Adare Manor before its refurbishment. Viewing took place on the Tuesday and Wednesday. Everyone was able to viewing items insitue and it was an enjoyable day out for lots of customers. Aidan sold approx 2,000 over two days with Bidding fast and furious. Internet bidders took some of the sales but in the end the Customers on the floor succeeded in securing 90% of the lots. Day One which included the Golf Clubhouse, Apartments, Beauty Rooms, etc at 10am and finished up around 9pm. Day Two was very exciting with all of the Manor Items up for sale and the auction ran right up to middnight. It was a marathon sale and very enjoyable for everyone involved. It concluded with another two busy days with people collecting their purchases. It was decided to move this contents to our Auction Rooms in Sixmilebridge as the weather conditions were poor and there was insufficient parking facility at this time of year. A 1500+ Sale with lots of interest from the Cork region with interesting books sold to collectors from the library at Dripsey. It was a very nice sale with everything from period Furniture, Curtains, Rugs, Paintings, Silver plate to Occasional Chairs, Beds and a Longcase Clock. Ashford Castle 7th & 8th February 2015. This Auction took place on behalf of Ashford Castle Hotel and conducted at their Warehouses in Cong. This was Phase II of the Sale. The sale was conducted over 2 days and yet again gained intereest from all corners of the globe. There was also of online Bidding interest together with many bidders on the floor. We were delighted to receive the business and wish Ashford Castle every success with their new refurishment. Ashford Castle 24th July 2014. This 1,000+ lot sale commenced at 9.30am and the final lot sold at approx 10.30pm that evening. A huge crowd gathered for the auction. Bidding was fast and furious with Customers from all corners of the country travelling to see what they could take home from this sale. The entire contents of this beautifully restored period house went under the hammer with Aidan selling fromearly morning till late. This 1,500 lot sale took place on the grounds of the house which included a Vintage Car, Porsche, Farm Tractor and two Vintage Motorbikes. It created lots of local interest but also attracted Clients from outside Munster.